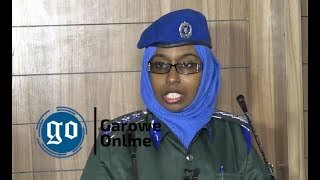 GAROWE, Puntland Oct 14,2014 (Garowe Online)-Puntland Government in northern Somalia has clinched deal with Mogadishu-based Federal Government after three days of intense talks in the state capital of Garowe on Tuesday, Garowe Online reports. Federal Government of Somalia’s Minister for Higher Education Du’alle Adan Mohamed read a 12-point agreement to the media in the presence of Prime Minister Abdiweli Sheikh Ahmed Mohamed, Puntland President Abdiweli Mohamed Ali, United Nations envoy to Somalia Ambassador Nicholas Kay, EU’s Ambassador Michele Carvone d’Urso, IGAD representative Mohamed Abdi Afey, Ethiopian consul General Asmalash Woldamirat and the negotiating teams. 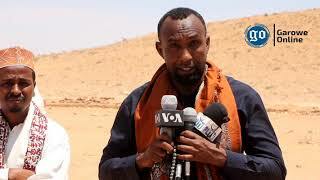 According to Adan, the recent tripartite agreement by Galmudug authorities, Himan and Heeb local administration and the paramilitary group of Ahlu Sunnah Wal Jamea on the formation of Federal State in central Somalia will not affect Puntland boundaries: “Central state consists of south Mudug and Galgaduud regions”. 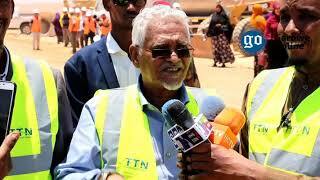 Moreover,the bilateral agreement stated that Federal Government has recognized Puntland Secondary school certificates. In accordance with the agreement signed by the then Puntland President Dr. Abdirahman Mohamed Farole and former Prime Minister Abdi Farah Shirdon, Mogadishu and Garowe will cooperate with each other on the establishment of inclusive and united National Army. On Foreign aid quotas and the Federal Constitution which Puntland said-contains clauses and articles that were tampered with without mutual consensus, the two agreed to the even distribution of international assistance and future discussions over the provisional constitution by parliamentary committees representing Puntland and the Federal Government. 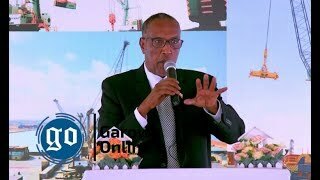 Federal Government delegates are said to have unveiled that they are in quandary about the issues pertaining to oil exploration deals with foreign entities and Mogadishu-Somaliland dialogue. Addressing event participants, Ambassador Kay expressed delight with the outcome of three-day roundtable meeting and urged the two parties to work for the common good. “I am happy with the agreement, I remain confident about what has happened and more importantly the good thing is that both sides showed off effort to reach consensus,” said UN envoy. Continuing, Kay noted that statebuilding process appears to be gaining momentum and requested Federal parliament to right away vote on election commission ahead of 2016 election. 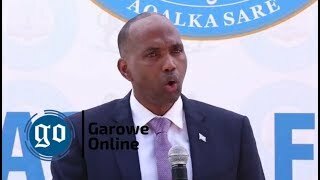 IGAD representative to Somalia, Afey on his side called the bilateral agreement a ‘historic’, indicating that it would put an end to recurrent disputes. During his stay in Puntland, Prime Minister Mohamed convened roundtable meeting, joined Puntland people in marking National Flag Day and visited Qardo, 122km northeast of Garowe at invitation from Darod clan king. Puntland separately struck two agreements with Mogadishu-based Federal Government in August 2009 and in March 2013, with the latter failing to get the backing of President Hassan Sheikh Mohamud. 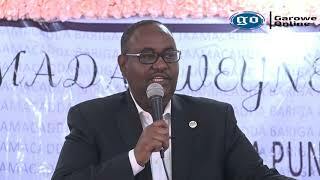 Ministry of Higher education allotted 25 pc of scholarships for Puntland Secondary school students with outstanding academic merits under former Interim Prime Minister Omar Abdirashid’s incumbency.